The Bill and Melinda Gates Foundation has award a grant to Bristol Robotics Laboratory to develop a battery fueled by human urine. When Bill Gates isn't busy being a secret Reddit Santa, he heads the Bill and Melinda Gates Foundation with his wife, Melinda. 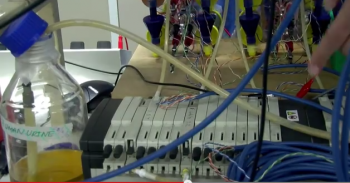 The foundation has just awarded a research grant to Bristol Robotics Laboratory in Bristol, England, to further develop a technology that converts human urine into electricity that can be used to powered a smartphone. You read that right: a pee-powered smartphone battery. The scientists have already demonstrated how their pee-powered battery, dubbed the "Microbial Fuel Cell", can work to power your smartphone. In simple terms, Inside of the cell are micro-organisms that take the urine, break it down and output electricity. In addition, the unit expels a broken down version of the urine, which make it safer to dispose of. If you're thinking you can't possibly extract much electricity out of a number one, you'd be right, as the scientists say the biggest challenge is to string enough of these converters together to provide a useful level of electric output. If saving up your pee in bottles seems like a far-fetched and possibly inefficient way of making electricity compared to traditional means, but the Bill and Melinda Gates foundation specifically looks for inventions that would help third-world countries who don't have easy access to luxuries such as electricity. It could also find use in first-world sanitation plants, as both a way to make waste safer to dispose of, and generate a little bit of extra power on the side.